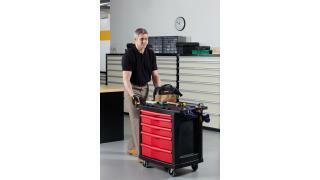 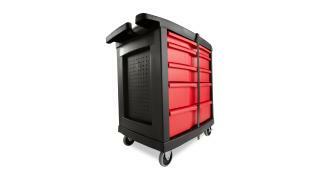 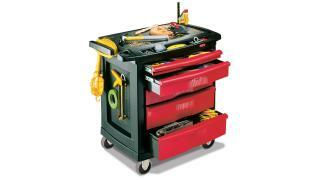 The Rubbermaid Commercial Mobile Work Center, 5 -Drawer, provides a mobile work station for up to 250 lbs. Measures 32-5/8" x 19-13/16" x 33-1/2"
The Rubbermaid Commercial heavy-duty Mobile Work Center, 5-Drawer, supports up to 250 lbs. 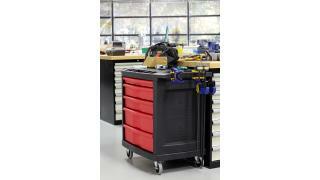 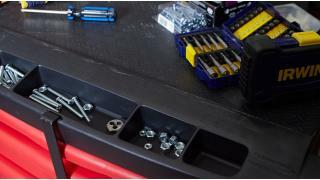 and features 5 drawers with a locking bar for securing contents and keeping drawers in place during transport. 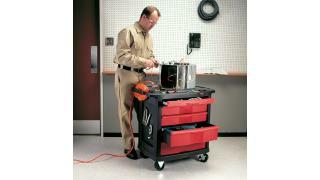 With a flat work surface and 4" locking casters, it has a built-in cord wrap perfect for worklights and power tools while pegboard side panels and molded pockets provide convenient organization. 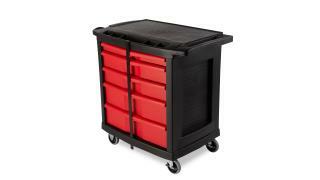 Sign up for the latest news from Rubbermaid Commercial Products.